Just inside the Santa Maria branch of the Santa Barbara County Foodbank's open garage door sat two massive crates, one holding 30 bags of non-perishable food products, the other holding fresh produce. 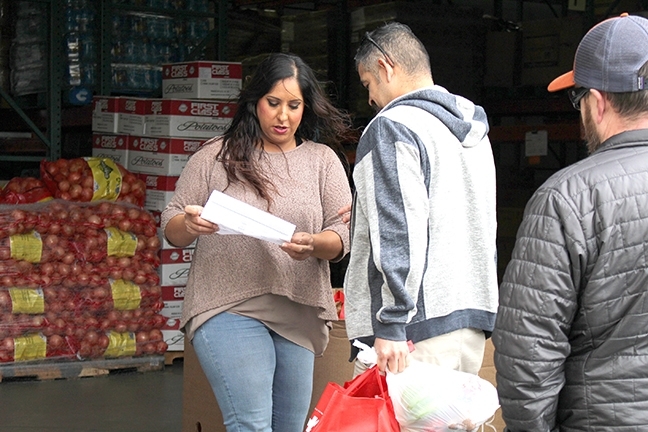 Two employees stood behind them, offering brief explanations and help to those who trickled in to pick up food, which was being distributed free of charge at the Foodbank's Santa Maria and Santa Barbara locations on Jan. 11. Those who showed up weren't the Foodbank's typical crowd. They were local federal employees, who as of Jan. 11, had been out of work or working without pay for three weeks because of the partial government shutdown. With no end to the shutdown in sight, some local organizations are stepping in to help Santa Barbara County residents who are forcibly living without paychecks. "Regardless of who you are, it's hard to ask for food," said Monica Buenrostro, office manager at Santa Maria's Foodbank, as she waited for more federal employees to show up. "But there shouldn't be shame. We've all been there." Buenrostro had been helping attendees for nearly an hour that day, and roughly 24 furloughed employees had already come to get food. Some thanked her profusely. Others, including one Santa Barbara Municipal Airport employee, brought unnecessary identification and documentation to prove that they really did have federal jobs. Some apologized, or shyly grabbed the bags of food, nodding and quickly walking out without saying a word. One attendee, who asked to remain anonymous, said that he has worked at Lompoc's Federal Correctional Institution for nearly two decades. He's still working now, despite the shutdown, but said he isn't being paid. Fortunately, he said, he had some money saved up. But he has a family of five, and they've gone through the savings quickly. "Normally I wouldn't do something like this because I have a job," he told the Sun, holding up a bag of non-perishables and another of fresh produce in each hand. "But I have to take care of my kids." Local furloughed federal employees line up to receive food at the Santa Barbara County Foodbank’s Santa Maria location on Jan. 11. The event was the first in a series of distributions aimed at helping federal employees who are going without pay during the government shutdown. That employee was just one of about 50 who attended the Foodbank's distributions countywide on Jan. 11, according to Judith Smith-Meyer, the Foodbank's marketing communications manager. The distributions, which were held from 1 to 2:30 p.m. were thrown together in about a day, Smith-Meyer said, after a representative of the Santa Maria Airport called the Foodbank and asked about any available help for its TSA staff. Smith-Meyer said it then became clear to the Foodbank that the shutdown is impacting a number of employees in Santa Barbara County, which hosts various federally funded offices filled with federal employees. The distributions were fairly popular for how quickly they came together, Smith-Meyer said, and the Foodbank will be hosting others as the shutdown continues. 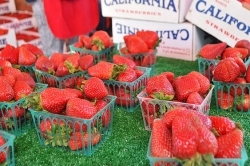 Those, she said, will likely garner even more attendees as residents become more aware of them, and the Foodbank has added another distribution location in Lompoc. Another organization, Peoples' Self-Help Housing, also plans to help those impacted by the shutdown, but in a different way. The nonprofit, which builds and runs thousands of affordable rental units throughout the Central Coast, announced on Jan. 24 that residents who are unable to pay rent because of the shutdown will not face eviction, and that federally funded construction will continue and be paid for by the nonprofit. Many Peoples' Self-Help Housing tenants live in federally subsidized housing, and the organization has not, and will not, receive those subsidies from the U.S. Department of Housing and Urban Development during the shutdown. A number of other Central Coast families are working with Peoples' Self-Help Housing to build homes that are being paid for through a U.S. Department of Agriculture program, and the nonprofit's president and CEO, John Fowler, said those projects will continue. "We're not going to evict anyone because the government isn't open," he said. The shutdown, Fowler said, is costing the nonprofit roughly $100,000 in internal reserve funds each week, and is impacting more than 2,500 tenants. As a financially strong organization, Fowler said that Peoples' Self-Help Housing can afford to fill the funding gaps created by the shutdown–but only for a few more weeks. "At this point, we don't know how long it's going to last, we talk about it every day, and our feeling is that we can go for a while," Fowler told the Sun. "We can carry this thing easily through February. After that, things start to get more difficult."